There have been many video game consoles developed over the years, but one retro console still appeals to players and this is the Game & Watch collection by Nintendo. This device is a handheld gaming console that was available from 1980 to 1981. While it only enjoyed a few years on the market, it is one of the hot collectibles today. The Nintendo Game & Watch collection was designed to play a single game on an LCD screen and the device also offered a clock and an alarm feature. This was one of the very first successful Nintendo products, soon to be followed by many more devices over the years that have made their mark in the gaming industry. As mentioned, each Nintendo Game & Watch device only offered one preloaded game, so players would have to purchase multiple units if they wanted to enjoy various titles. Over the span of two years, Nintendo released a total of 60 different Game & Watch games. Even though the device itself was only offered for a short amount of time, there were different series of the console that was developed up until 1986. The Game & Watch collections were very popular with younger gamers and today, they are hot items for those that enjoy retro-style gaming. 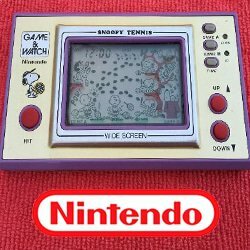 The first game to ever be released for the Nintendo Game & Watch was Ball. With this game, players were required to juggle various balls in the air and if they dropped a ball, the game ended. This game was a big success and was quickly followed by titles like Flagman, Judge, Vermin, Fire and Manhole. 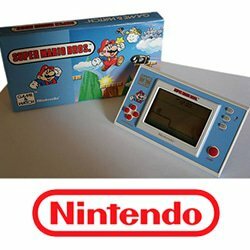 Eventually, Nintendo released now popular games like Donkey Kong and Mario's Cement Factory for the Game & Watch device. The majority of the early games released in the Nintendo Game & Watch collection were simple games that had basic controls, allowing players to move left and right and to jump. The game changer was with the release of Donkey Kong in 1982, where players were now able to control characters using the D-pad, or directional pad, on the device. This invention paved the way for future devices and a huge success for Nintendo with their handheld games. Eliminating the need for any joystick for control, the D-pad revolutionized handheld gaming and is still a basic component of devices that are made today. Even though the initial design of the game only lasted for a short amount of time, Nintendo released many versions of the game series. Ball was the first release of the Silver series and got its name from the metallic faceplate that was used. The Gold series was then offered, featuring a different faceplate and a coloured screen to offer a more vibrant gaming experience. There were just three titles released in the Gold series before the Wide Screen series was introduced in 1981, offering a screen that was 30% larger than previous versions. In 1982, the Multi-screen series was introduced and this was at the same time Nintendo offered the Donkey Kong game, the most popular title and the biggest selling. The Nintendo Game & Watch device was released 9 years before the first Gameboy was introduced, which was the highest selling handheld device at the time. The Gameboy was revolutionary as it allows players to simply use the same device and change cartridges to access different games. Once the Gameboy was released, Nintendo ceased all production of the Game & Watch and focused on its new line of products to deliver a more enhanced gaming experience. Prior to the release of the Gameboy device, Nintendo focused on consoles, presenting players with the NES console in the mid-1980s. For over a decade, this console was a huge seller and in 1989, one of the highest selling games was introduced, Zelda. This was the same year that Nintendo also rolled out the ever popular Gameboy collection. This device combined the design of Nintendo Game & Watch collection and the NES console to deliver easy controls and the ability to play multiple games. Over the years, many titles were released and the Gameboy remained one of the leading gaming devices in the industry. The original release of Gameboy offered a simple screen, which was upgraded to colour with the release of Gameboy Color. In 2000, both of these devices were discontinued and Nintendo offered the latest release, the Game Boy Advance in 2001. However, during the time of the popularity of the original Gameboy device, Nintendo offered other versions of the console, including Game Boy Pocket and Gameboy Light. For years, Nintendo has been credited with developing the best handheld video game systems, and it all started with the offering of that very first Nintendo Game & Watch.